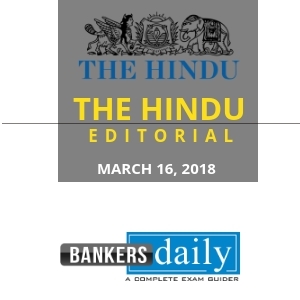 THE HINDU EDITORIAL – March 20, 2018, is one of the must-read section for the competitive exams like NIACL AO Prelims Exam, IBPS SO Mains Exam. These topics are widely expected to be asked in the reading comprehension, Cloze Test or Error Detection in the forthcoming exams. So gear up your Exam preparation and learn new words daily. When Pramod Sawant took office dramatically in the early hours of Tuesday as Chief Minister, it was the 23rd time that the regime in Goa changed since 1963, excluding five spells of President’s Rule. Mr. Sawant’s legislative majority is far from clear and the longevity of his government remains a subject of speculation. The State voted a hung Assembly in 2017, with the BJP winning fewer seats than the Congress. The machinations that led to the installation of a BJP-led government headed by Manohar Parrikar did not match up to any high standards of democracy. Parrikar’s image acted as a veneer for his party’s less than honourable pursuit of power. He was a moderate in the Hindutva party and reached out to Christians, who constitute 25% of the population. His return to the State after leaving the Union Cabinet was a condition set by parties and independents for supporting the BJP. He was able to considerably insulate himself from the afflictions of Goa’s politics. With his passing, politics in Goa could be less restrained. Its politicians should strive hard to prove the sceptics wrong. History, of course, does not counsel optimism. Multiple social and economic factors contribute to the volatility. Goa’s population, as per Census 2011, is just 14.59 lakh, and it is one of the smallest States also in terms of area. There are 40 Assembly constituencies, relatively small in size; most have less than 30,000 voters. Besides the Congress and the BJP, the Maharashtrawadi Gomantak Party, the Goa Forward Party and the Nationalist Congress Party are represented in the current Assembly. The main political contest is between the BJP and the Congress, but given the small sizes of constituencies and the close contests, the scope for manipulation of the electoral process is very high. Seasoned political players have perfected the art of setting up multi-cornered contests by fielding independents and fringe political outfits that fragment the votes and turn the tide to their benefit. Goa is the place where the many ills of Indian democracy play out in a stark manner. Land is scarce, with tourism being the mainstay of the economy. Mining, which used to be the other major driver of the economy, has been stalled by the Supreme Court since February last year. There are numerous avenues for political patronage, rent-seeking and generation of dirty money. The political system, rather than acting as a counterweight to the hazardous forces that its economy and geography generate, often ends up accelerating them. A government with a wafer-thin majority is unlikely to address these systemic ills. The pro-West Ukrainian oligarch, President Petro Poroshenko, has a battle at hand in his re-election bid on March 31. Given the crowded arena, including former Prime Minister Yulia Tymoshenko, a run-off cannot be ruled out. The President’s modest record in office, however, may not entirely be held against him, given the difficult geopolitical backdrop. The continuing conflict in the Donbas region of eastern Ukraine exerts a heavy toll. Over 10,000 lives have been lost since Russia’s 2014 annexation of Crimea. Millions have been displaced, with the resolution envisaged in the Minsk Accord proving elusive. The government has signed a free-trade pact and a separate association agreement with the European Union, and got strong economic and military backing from Washington and Brussels. Memberships of the EU and NATO are among the government’s long-term objectives. Ukraine has also been rewarded with an IMF aid package worth billions of dollars for improved governance and enacting anti-corruption legislation. But the increase in the price of household gas and other conditionalities stemming from IMF assistance have fuelled popular discontent. Mr. Poroshenko has been especially concerned about not loosening his grip on power or political legitimacy since Moscow’s recognition of polls last year to the breakaway provinces of Ukraine. When tensions flared up in November after Russia seized three Ukrainian naval vessels on the disputed Azov Sea, Mr. Poroshenko imposed a national emergency. The move was criticised by the opposition as an attempt to capitalise on the conflict with an eye on elections. Opponents are anxious to tap into the popular frustration with the prevailing situation. For his part, the President has adopted an overtly nationalist posture in recent months. Billboards in support of Mr. Poroshenko extol the army’s role during the conflict, besides carrying invocations to the country’s faith and language. The reference to religion is evidently meant to celebrate the recognition the Ukrainian Orthodox Church won late last year as an autonomous establishment. Independence from the Russian Orthodox Church is a watershed after centuries within the larger fold. Similarly, importance is sought to be attached to asserting the separate identity of the Ukrainian language, predominantly spoken in the western part of the country, over Russian. An exaggerated sense of the distinctness of cultural symbols may at best prove politically expedient in a society with a long pluralist legacy. Mr. Poroshenko should exercise caution not to overplay these issues. His opponent Ms. Tymoshenko is expected to be the frontrunner in the first round of voting on March 31. While she favours engagement with the West, her populist stance, both on the domestic and foreign policy fronts, has not impressed observers in Brussels or in Washington. A close contest is in the offing. But whatever the choice the Ukrainian voters make, their problems are unlikely to disappear in a hurry. Meaning : not taking someone or something into account; except. Meaning : a cause of pain or harm. Meaning : a person inclined to question or doubt accepted opinions. Meaning : give (something, especially money) in order to help achieve or provide something. Meaning : provide with a set of clothes. Meaning : severe or bare in appearance or outline. Meaning : (especially of food, money, or some other resource) insufficient for the demand. Meaning : stop or cause to stop making progress. Meaning : increase in rate, amount, or extent. Meaning : lie behind or beyond; serve as a background to. Meaning : difficult to find, catch, or achieve. Meaning : make (a bill or other proposal) law. Meaning : readily distinguishable by the senses.